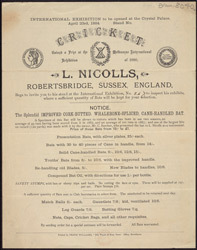 L. J. Nicolls started making cricket bats in 1876 in a small workshop in Robertsbridge, East Sussex. The bats were hand crafted and only the finest quality willow. W G Grace owned a Nicolls cricket bat and used it during the match when he made his record breaking 100th century (or 1000 runs). Nicolls supplied the firm H. J. Grey and Sons with all their cricket bats and in the 1940s the 2 firms merged to create the sports equipment suppliers Grey-Nicolls, who are still well known today.